And to all those who remember a certain deodorant campaign, no, bees don’t perspire either. 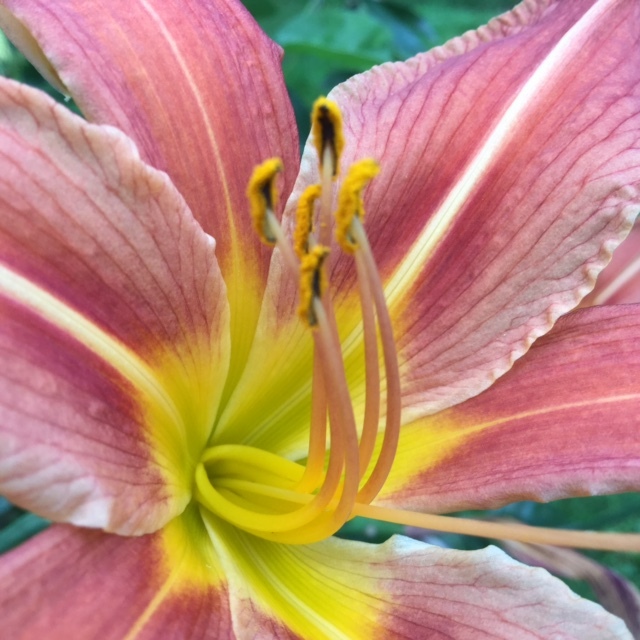 Although those of us in Portlandia are now suffering from a resurgence of icky, cold, rainy weather, we did get a brief taste of summer recently with temperatures soaring over 100 degrees Fahrenheit (that’s a sweltering 38 degrees to the metric folks out there). While I was able to cool off with a few gallons of iced tea and plenty of sweat (perspiration? ), my bees are sadly lacking in both refrigeration technology and sweat glands. So what’s a bee to do when the hot days hit? Inside my hive right now are thousands of bees all busily going about their work day. That many bodies moving around at a busy-bee pace generates quite a lot of heat. This is good when it’s cool out, but it’s like having a completely shut up house crammed with people on a hot day…it’s hot and it’s going to get hotter. The bees solve the problem much as those of us without air-conditioning do…they turn on a fan and they go outside. No, the bees don’t make a trip to Home Depot to scramble for the last house fan in stock. They sit outside the entrance and beat their little wings to create air circulation. Because they are also collecting oodles of water during hot spells, the fanning creates a nice bit of evaporative cooling that also helps ease the heat. 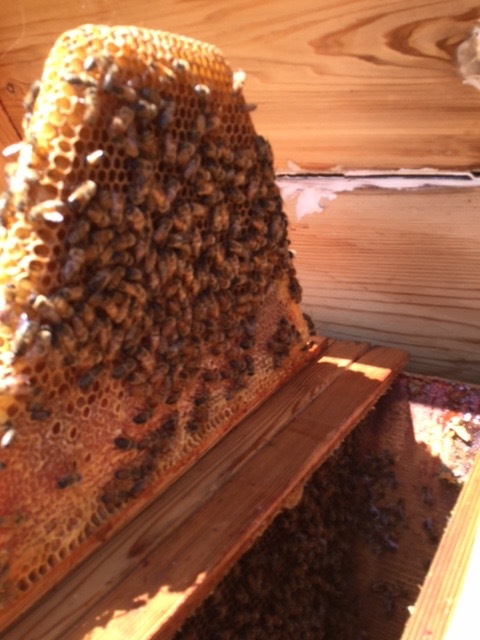 With fewer bees inside and bee-style air conditioning, the inside of the hive stays the proper bee temperature. I have to say, I hate the beard trend that men (especially in Portland) have adopted. As if male grooming is SOOOO difficult. 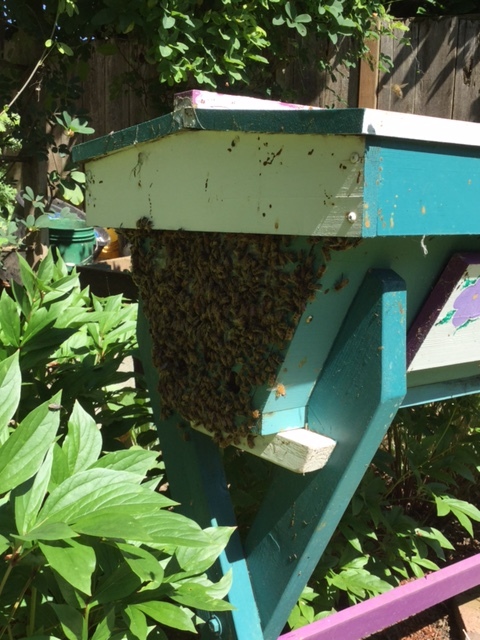 However, the one beard I don’t mind seeing is on my hive because it means the bees are doing exactly what they’re supposed to do. It’s called “bearding” because if you get enough bees outside, they end up hanging off the edge of the hive like a beard hanging off a man’s face (ick). That’s a mighty nice beard! To non-bee folks this bearding can look a bit scary. But it’s just bees going about their work in service to the colony and unless you start messing with them, they’re going to ignore you. So leave them alone and let the little workaholics do their job. First, do not think to yourself, “Oh no those poor bees are hot. I should spray them down with the hose to cool them off.” No no no no. If you have a mister (as in a little system that sprays fine droplets of water, not a man who goes by his surname), the bees won’t mind visiting it, but set it up to water your plants, not to water the bees. Bees can easily catch a chill, get too weighted down to fly, or simply drown when sprayed with water. Spraying can also introduce too much water into the hive upsetting the careful moisture balance and leading to fungal problems (ew!). Instead, provide clean water in a shallow dish that is filled with rocks or pebbles for the bees to perch on while they belly up to the bar. They can go through A LOT of water each day so check the dish often. Second, leave them alone. Bearding bees aren’t aggressive, but they are hot, and like a hot human they can be cranky. If you’ve seen images of people making “bee sleeves” of thousands of bees on their arms, this is not the time to try that trick. Third, as always, provide plants bees enjoy. Despite the heat, they’re still working to make honey and set up stores for the winter, so make it as easy as possible for them to find some quality goodies. 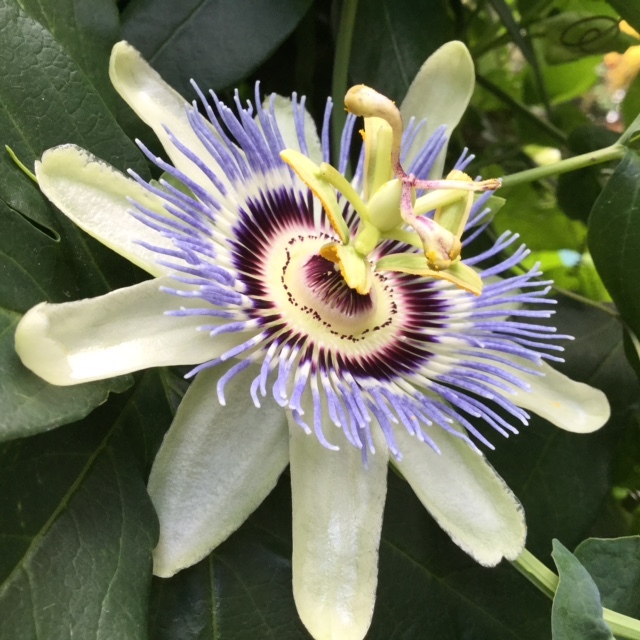 The Xerces Society has a great page full of regional plant guides for bees as well as links for gardeners around the world who want to plant bee gardens. Unless something really exciting happens, that’s about it for my bee news for a while. Thanks! The bees are always interesting to watch. It’s cool (no pun intended) to see so many of them outside on a hot day. Usually you just see them darting in and out of the hive. And the beards, yeah, so many men have devolved. The bees are like little torpedos shooting from the hive all day. And yes, Portland has become a land of cavemen. Me too! over groomed men are def a turned off ! There’s a fine middle ground when it comes to men’s grooming. I want him groomed but not spending more time in front of the mirror than myself! Yep. If he uses more beauty products than me, he’s out the door! How many do you use? Well I have to admit I’ve become a tad addicted to lotion…but the first step is admitting you have a problem, right!? Body lotion, face lotion, hand cream. See, total junkie! Actually the face lotion addiction began when I was plagued with some nasty rosacea and was trying to find gentle stuff for my face. The rest…no excuses, just a junky. I use none. Im rubbish! I don’t feel very fiery in the winter when my hands are turning white from the cold! I think my pitta side goes into hibernation or something! I’m definitely a basket case when the snowball starts rolling down the mountain too fast for me! Not that many, for a girl! I always wonder what those shaggy beard guys are hiding…and what manner of Eco-system is going on in that facial forest. Ew. Erk. I didn’t think about what would happen after the ecosystem-razing shampoo went down the drain. Sorry, nature! Soon we’ll see activists tying themselves to men’s beards just to save the hirsute ecosystems! I’m painting my “hair today, gone tomorrow” placards as we speak. They do like their sugary snacks!